Trojan programs. What are they? "A program that neither replicates or copies itself, but does damage or compromises the security of the computer. Typically it relies on someone emailing it to you, it does not email itself, it may arrive in the form of a joke program or software of some sort." As you can see a trojan program need to be started automatically to begin its work. Prevent from starting this program and it will be not more dangerous than a dust on the road. You may quickly decline changes and restore your working startup. What the startup holes are monitored by WatchDog? File Extensions (may be expanded by user): pif, bat, com, exe. Finally: STARTUP and COMMON STARTUP folders. File Extensions(may be expanded by user): pif, bat, com, exe. Another way to auto run trojan is substitution of the execution files and DLLs used in the startup. Most of known e-mail trojans substitute WinSock DLL. RegRun has two features to prevent substitution. RegRun automatically detects files that will be replaced with the next restarting of Windows. Windows needs to use special technology to replace opened files a like system DLL or executable files. Windows 9X and Windows ME uses "wininit.ini" file located in Windows folder. File Protection RegRun File Protection copies the original files to the special "storage" folder. RegRun File Protection supports full file comparison or signature checking. If you check the box "Use Signature Checking" RegRun makes an MD5 signature of the source file and saves it. While comparing, it compares the original signature with a calculated signature. File Protection allows to protect any files and to quickly restore them. 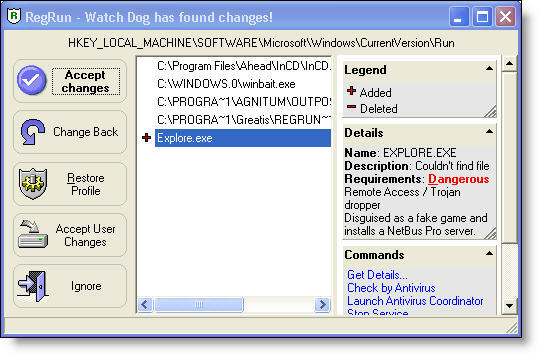 RegRun is the effective tool against trojans. The main advantage of the RegRun is its possibility to fight agains unknown trojans! RegRun is the advanced trojan detector! Viruses: "A program or code that replicates, that is infects another program, boot sector, partition sector or document that supports macros by inserting itself or attaching itself to that medium. Most viruses just replicate, a lot also do damage." RegRun doesn't replace antiviral software. It has the Infection Detector feature. RegRun uses special technology to search for viruses unknown to antiviral software. This is not signature scanning, but rather "infection scanning". During a session, RegRun opens and monitors a number of "bait" program and macro files which are vulnerable to infection by any active virus. If any of these files change, RegRun will advise you, and facilitate your communication with your antivirus supplier by providing you before and after samples. RegRun uses advanced technology to detect UNKNOWN viruses!